I'm pastey, as in I glow in the dark, as in no matter what I do I can not get a tan on anything except my arms and shoulders. When OzNaturals offered up this amazing new product I was beyond excited to try it out. 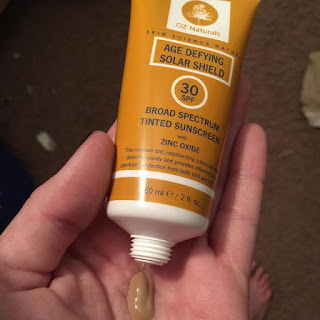 It's a tinted moisturizer just for people with my same pastey skin! SPF - It has SPF protection and this matters because you should never leave the house without SPF protection. Tinted - Hey, like I said I'm pastey and being able to add a tad bit of color to my very pale skin while protecting it at the same time....priceless. Natural - OzNaturals prides itself in all natural products. Why put more chemicals on your body than is needed? So far, so good. No side affects or problems. I haven't seen any issues with the dreaded "self tanner" orange look or missed spots. It's a very faint tint. I'm impressed and if you are too you can purchase yours here.